Health Communications Inc, 9780757321467, 192pp. From the Far East to the Mid-East to East L.A., love is the deepest desire of the human heart, yet often the most elusive. Throughout the centuries sages have sought a path to true love, but the host of SiriusXM Stars 109 Psychic Connection with Deborah Graham actually knows how to harness and hold onto it. Graham has shown many perpetual wayward daters how to navigate text messages and emojis to truly connect with their perfect match on a soul to soul level, and here she reveals how you can, too. As a gifted psychic, Graham is able to read auras: she doesn't look at you, she looks in you. She has spent decades helping people find true and lasting love, and through this book she will coach you to do the same—to look past the outward façades that people project to the world, and to look inward, starting with yourself. By stepping you through a "spiritual cleansing," she will teach you how to purge past issues and baggage so that you are open and ready for real love. SiriusXM Stars 109 Psychic Connection with Deborah Graham is a national show that airs weekly and generates over 12,000 calls per hour! Here's what SiriusXM has to say about her: "If Deborah sat in a room for ten days straight and answered the phone 24/7, she would still not be able to take all the callers who dial-in every week." That's because her advice works and that's what makes her show so popular. With this paradigm-smashing new book, you can learn to apply Graham's complete approach to finding true love. Read it today—get to know how to look into potential partners and how to truly find your heart's desire! 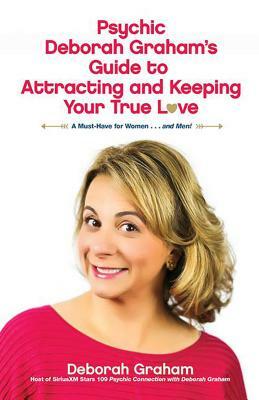 "If you're looking for love, Psychic Deborah Graham's Guide to Attracting and Keeping Your True Love delivers the same no-holds-barred advice she gives to her thousands and thousands of fans on her radio show, Psychic Connection with Deborah Graham. Tune in. And read it!" —Tim Johnson, Senior Director, Entertainment & Lifestyle Programming, SiriusXM Radio, Inc.